We renovated and partly rebuilt our living in autumn 2010 but our living room was not completed yet last summer. We wanted to hang some 2 vertical photos above the sofa and we were thinking about something elegant, perhaps in black and white. Moreover, we wanted the phtos to have some link, perhaps presenting the same subject. Of course that I wanted to use my photos but as no 2 were suitable for this I had to make some new ones. 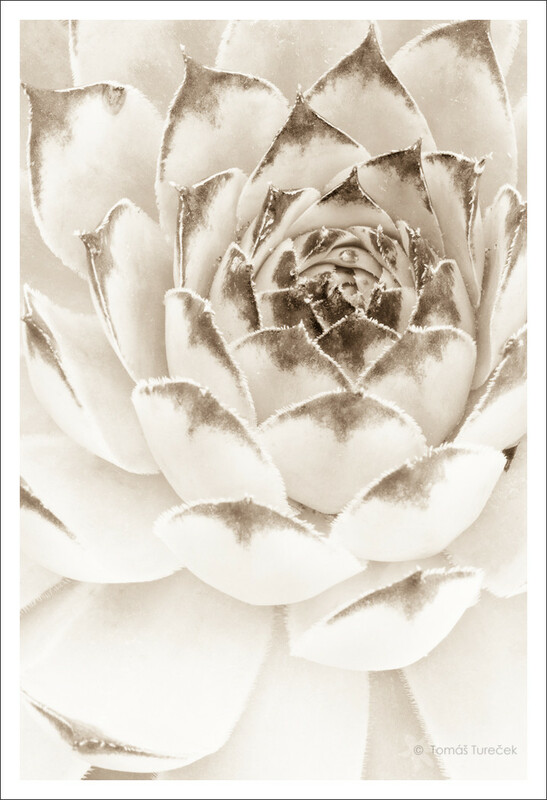 I was drawn to succulents in our garden (Sempervivum tectorum to be exact) by that time, observing simple, yet elegant, lines of their leaves. One day I finally decided to take some photos of them and started processing them immediately. Have you ever realized how much dirt is on the flower having its leaves only couple centimetres above the ground? I had to clone out around 100 specks on each photo! When photos where “clean” enough I tried different presets in Lightroom and really liked what infrared preset did with photos. A light touch of sepia and it was ready. Even though I was really happy with the result after some time of watching the photos we decided to not hang them because if you observe it for a while you will notice tiny thorns on edges of leaves and it doesn’t evoke pleasant feelings. So after all we chose different solution but I still like these photos and therefore I want to share them here with you. If you wonder what was the final solution, it couldn’t have been more different. 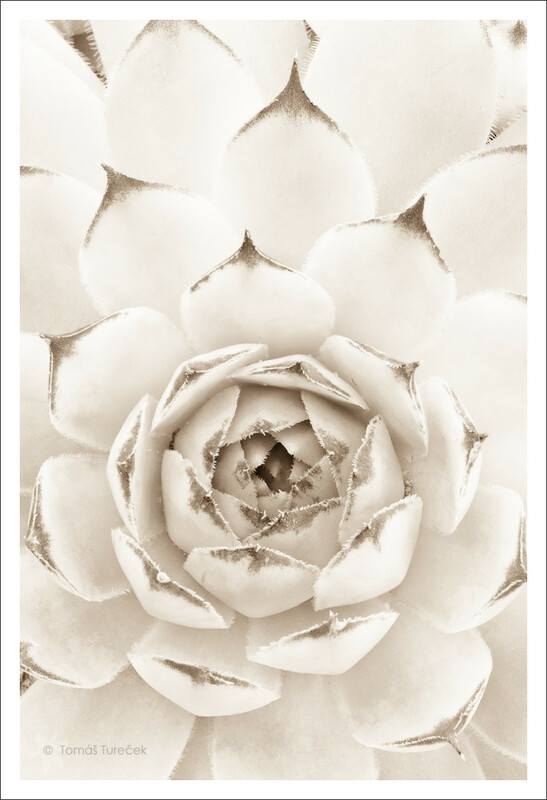 We selected 8 photos from my collection, four in white tones, other four quite colourful and we put them together so that it makes a somewhat compact unit. This is nice example of how initial idea can change radically and still be acceptable. Let me know if you like these photos with inverted-like feel and enjoy the winter until that time. Technical information: photos in this post were taken with camera Canon EOS 450 and Canon EF 100mm USM f/2.8 macro lens, mounted on a tripod, under natural conditions, outdoors. It has been almost five months since my last post here and for almost the same time I haven’t held camera in my hands. This break from photography was unintentional and actually it was my longest break from photography in several years. What caused it, you ask? Well, even I am not absolutely sure. In the first half of this year I took much more photos than in any year before and before the break I was taking photos every day for more than a week. Then a need for taking photos left me suddenly. My other great hobby are books and during winter time I tend to read really a lot. Almost all my free time is spend with a book in my hand. Before summer I usually feel so full of stories that I can’t absorb more for some time. I feel like fully satiated. The pace slows done or sometimes stops completely. I think the same may have happened with my photography. Have you ever experienced something similar? So I divided all my time between my work, my family and my other hobbies. It is true that both my work and my family needed, and still need, much more time than in past so there isn’t much time for the other hobbies either. 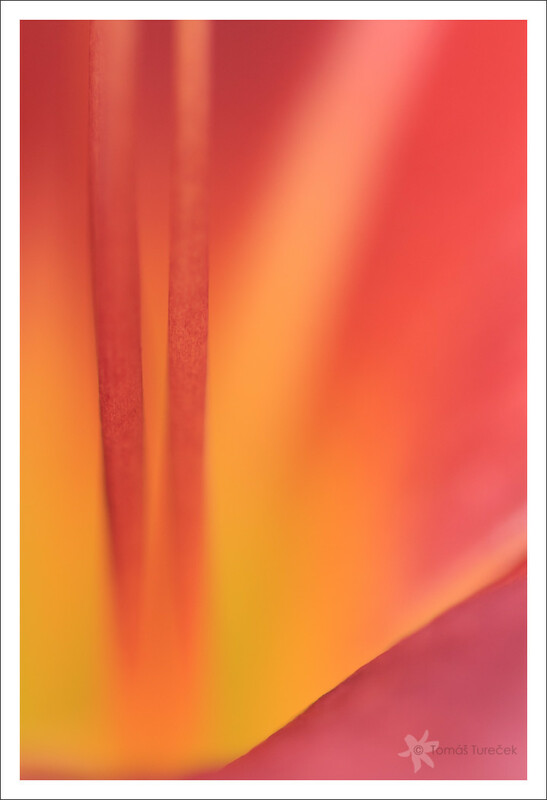 I used photos with higher f-stops for sharper petal edges and nice soft gradients from f/2.8 for the rest of the image. Colours are strong but I like it as it turned out. There is only small adjustment to saturation which is not to saturation directly but to vibrance in Adobe Lightroom instead. Vibrance enhances saturation of colours which are in minority on the photo. I really hope that I will come back to photography (and this blog) more frequently now, presenting new and also old photos. I have still some photos taken back in July which I haven’t processed before the break started. Finally, I would like to thank all of you who have been visiting this blog in those months, hoping to see some new posts. It is really good to know that there are people who cares for I do. Thank you! Have a wonderful Christmass season and cherish your close ones. Technical information: photo in this post was taken with camera Canon EOS 450 and Canon EF 100mm USM f/2.8 macro lens, mounted on a tripod, under natural conditions, indoors. 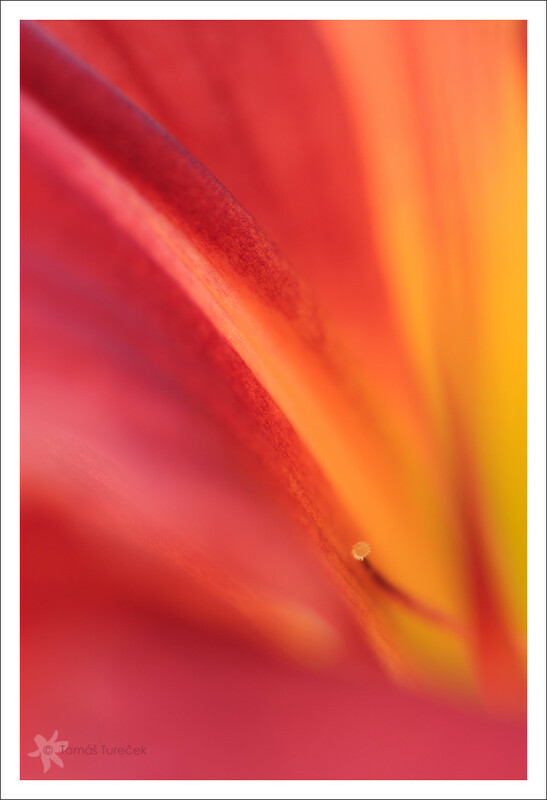 Daylilies are flowers which brought me to macro photography and to flower photography in general. We have a daylily “bush” in a garden and I try to take some photos of it every year when it is in bloom. This year their season is slowly ending and so I am posting my latest attempts. Click on the photo to see it in bigger resolution. The more photos of one subject you take the more complicated it is to take another and not repeat yourself. With daylilies I still focus fully on “colour flows” and lines but I am also looking for something unique in the blossoms that would make the photo special. In the photo above it is the stigma which is usually erected out from a blossom but sometimes it stays inside. I like to look for an interesting interaction between abstract shapes and lines supported by colour gradients. 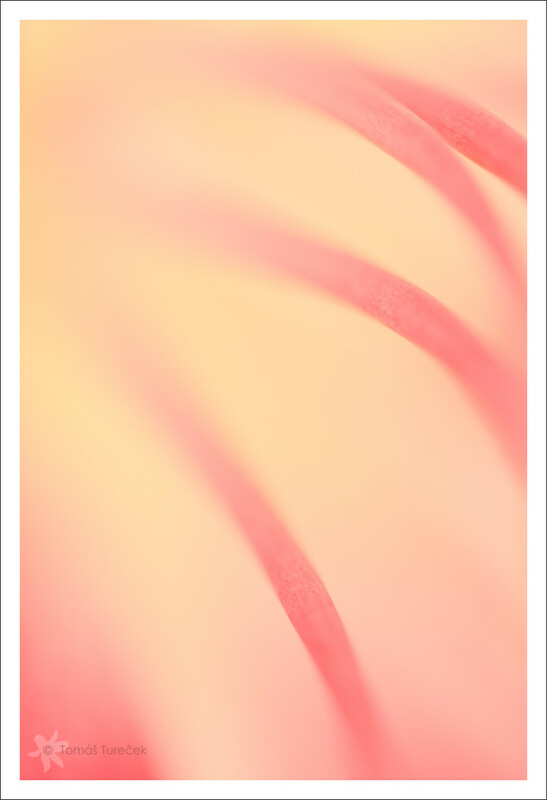 In the photo above two stamens were going in parallel evoking look of those double glass lifts. Lifts for insect perhaps. Photos above are “common” ones, with minimal post processing. As I was working with the photos below I thought that perhaps it’s time to try something a little bit different. To make these abstracts a little bit more special. Image rotation, low contrast and high brightness did the trick here. I was tempted to give it title “Ribs” but I resisted because the photo evokes pleasant feelings in me which wouldn’t persist if I would use the title. Brightness slider went unusually high also for last photo even though not as high as for the previous one. I like the juicy colours in this one. All these photos were taken indoor this time. The blossom was on the windowsill to absorb as much sun light as possible and then slightly shaded from direct light so the colours could pop. Without shading the colours and light were too strong, too harsh. I will be definitely glad for your opinions and if you would like to compare it with my daylily photos from previous years, here they are (2010, 2009). Technical information: all photos in this post were taken with Canon EOS 450D camera and Canon EF 100mm USM macro lens on a tripod; under natural conditions. 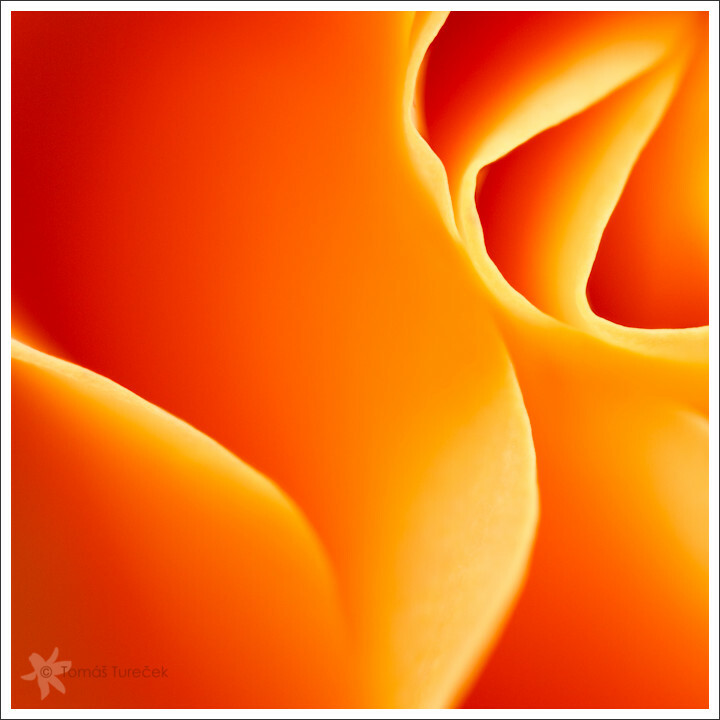 The Nature Conservancy is holding its 6th Annual Digital Photo Competition. This year, it’s easier than ever to enter using your Facebook log-in info – http://photocontest.nature.org/ or through The Nature Conservancy’s Flickr Group – http://my.nature.org/photography/flickr.html. Original digital photos that feature the natural wonders of the lands, waters, plants, animals and people around the world are all eligible for the competition. This year at least 35 photos will be selected as honorable mentions and finalists, and our online community will vote for their favorite images to determine the winners. The grand prize winner will be featured on the cover of the 2013 Nature Conservancy calendar. This competition is open to all photographers age 18 years or older regardless of residence or citizenship, as long as the laws of their jurisdiction allow participation. Photo submissions must be uploaded by 11:59 pm PST Monday, September 12, 2011. For more details, please visit http://photocontest.nature.org/ and feel free to contact me with your questions. When I was looking for a photo to accompany this message I came up across this one which wasn’t posted , yet. 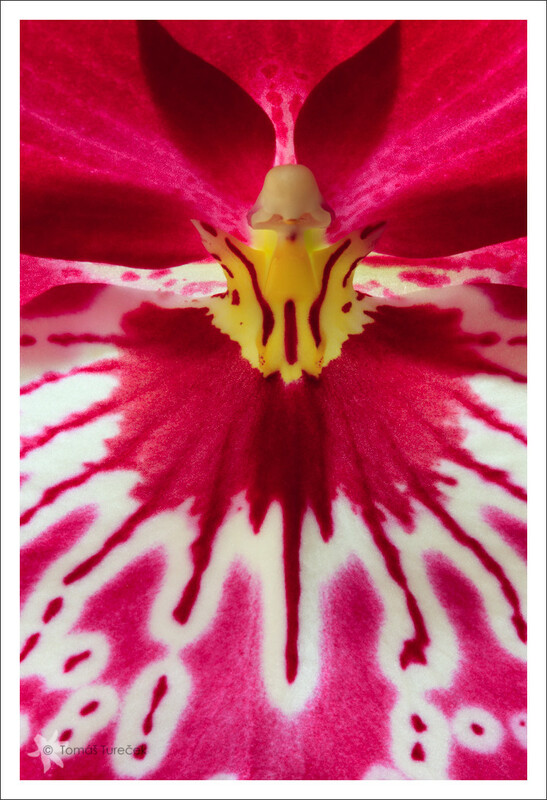 It is direct shot of central part of Miltonia orchid blossom. 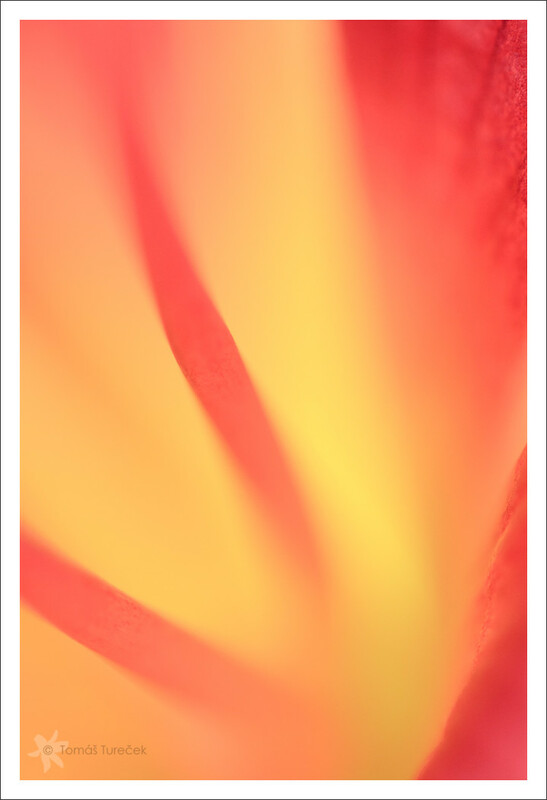 The flower was on a windowsill backlit by afternoon sun light. I was amazed by the patterns and colours. Technical information: all photographs in this post were taken with Canon EOS 450D camera and Canon EF 100mm USM macro lens on a tripod, in natural conditions. Today it is exactly 2 years from my first post on this blog and I think that it is a good opportunity for sharing some statistics and small elaboration on those years with you. There has been published 77 posts on this blog until today (excluding this one) which makes an average of 3.2 posts per month. 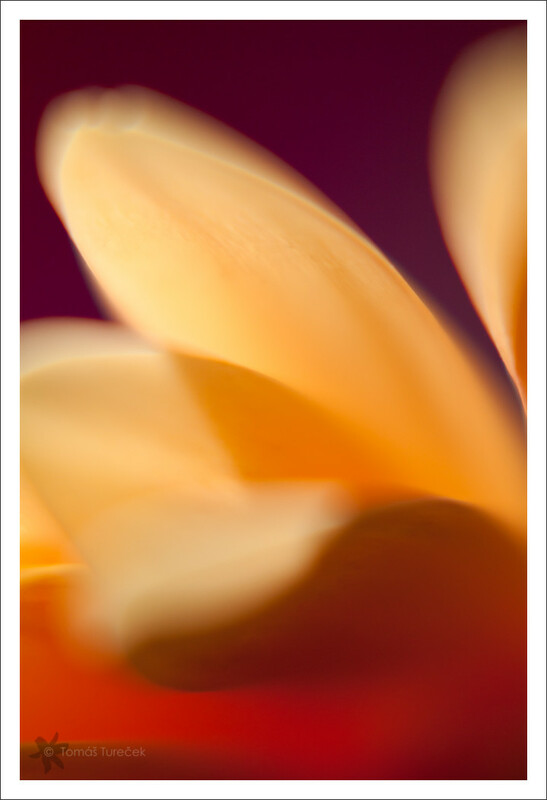 TOP 3 most visited posts are: My free textures, Negative Space in Flower/Macro photography and Awakening interest. There was 11567 visits in those 2 years. Number of visits has grown by 43% in the second year of my blogging. Average number of visits in first year was 14 while 19 in second year. The busiest day so far was April 11, 2011 with 70 visits. While thinking about the posts and my progress in photography in those 2 years I think that I still take photos with the same intention – capturing details which we can see every day but which we don’t realize or which we simply overlook as common or not interesting. I try to work with impressions. I want my photos to impress viewers for which purpose I work with colours, simple shapes and sometimes with processing which makes certain photo everything but common. I heard that most of blogs won’t survive 13th month of life. It is true that previous year was demanding at me and I had a lot of other things than photography to focus on. Result was that I haven’t had even thoughts for photography and I was glad if I was able to make a post per month, sometimes not even this. With this year approaching I got a new energy to my veins and I can say that I have been focusing on photography much more in past months than in any time in those past 2 years. Hopefully it does not have effect on quality of my late photos but I will leave this up to your decision. When it comes to my source of inspiration, at first place it is nature itself. There is so many interesting subjects in so many forms that I’m really not afraid of running out of subjects and ideas for photos. At second place it is you, photographers with similar scope in photography. I am following photo blogs and photo sites such as flickr on daily basis which provides decent amount of excellent photos which inspires me in some ways. As time goes by some photographers have become silent and in such cases I always wonder what happened to them. We never know what awaits us. When I was thinking about suitable photo for this post I came across following one which, as I think, sums up one side of my photography. It is a photo of Gerbera taken some months ago. I was interested by those bold colours. I don’t remember what was the source of the violet in the background I only know that it was some other flower. Looking at the visits, it really impresses me and I want to give a BIG “THANK YOU” to all of you who are visiting my site either accidentally, sporadically or continuously. You all help me in getting this blog further and you help me also with my photography either by giving constructive feedback or simply by your visits which creates a demand for another posts. Thank you all and I am really looking forward writing similar post after another year. Technical information: photograph in this post was taken with Canon EOS 450D camera and Canon EF 100mm USM macro lens with HOYA Close up +4 (dioptres) filter, in natural conditions. Panning or basically any camera movement during exposure is one of techniques to which comes almost every photographer who gained some experience and wants to try “something different”. It produces varying results, some excellent, worth of hanging on wall, some not as good. A set up producing usually very good results is vertical panning in wood, I wrote about it in my post Pan in wood. As a flower photographer I tried this technique also with flowers and got very nice result shared in post Creativity..unlocked! Simple panning, meaning vertical or horizontal movement is the most simple way with which probably everyone starts. 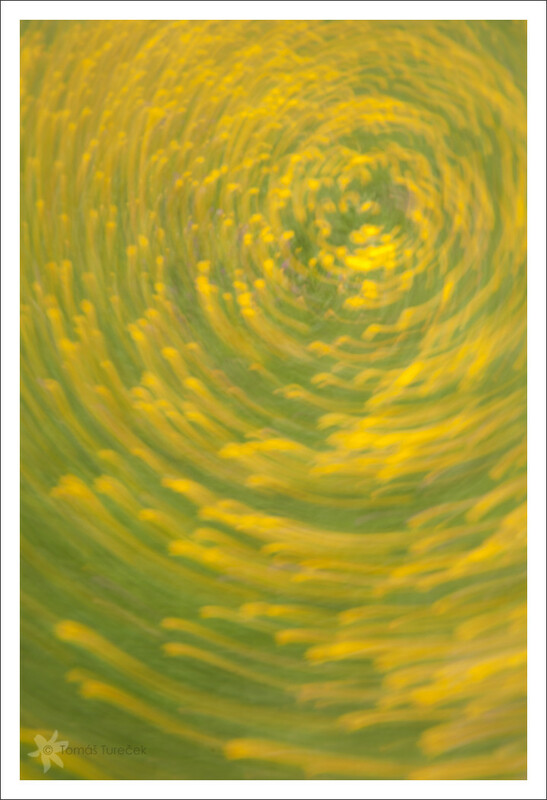 After trying this you can continue with rotation, zoom, combination of movement and zoom… whatever you want. Bad thing about this technique is that results are often hardly predictable. It happens to me that I do the movements which resulted in good photos in past but they suddenly do not work. Is it a subject or is it only me? In such cases I usually try other movements such as already mentioned rotation. I think that following photo is nice example. On this shot I captured part of our meadow which blooms heavily every year. Unfortunatelly, I don’t know the name of the yellow flower (it’s not Dandelion or Ranunculus) but I know that those pink/violet spots are cloverleaf blossoms. In case of this technique (rotation) I get one decent photo on maybe 10-20. Sometimes it’s really hard to get desired composition when you need to move your camera so quickly. When rotation technique fails, try whatever else. This past weekend I was trying to take some photos of our blooming lobelia pot but I wasn’t able to find decent composition with so many small blossoms so I tried panning. After several tries I came up with a photo which appeals to me. If I remember correctly, the movement which lead to this was crazy wobbling with camera from left to right so it’s absolutely impossible to repeat that movement again. I must say that I really like those bright lines and colours. 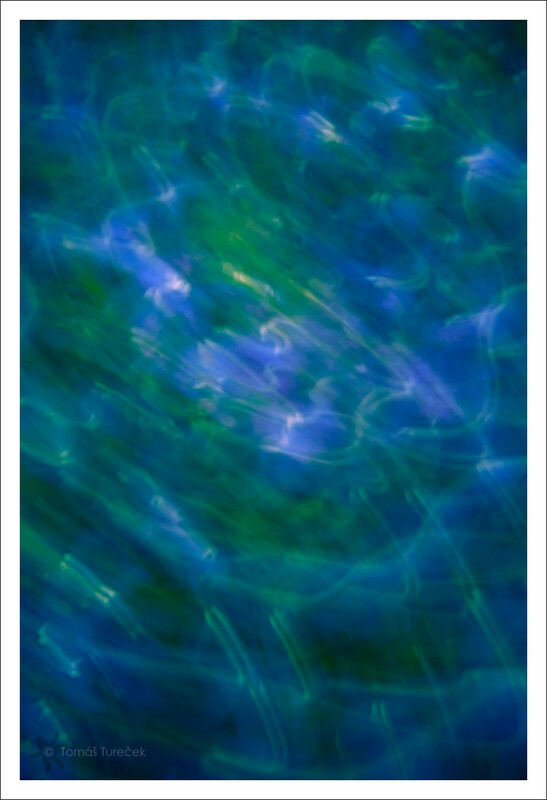 It reminds me refractions of sunlight on water surface. If you want to try something new, something original, something that results in interesting photos or if you just like what you see here, grab your camera and give it a try. If you will be patient, you will definitely get something very interesting even after your first tries. I wish you a lot of fresh energy into the starting week! Technical information: all photographs in this post were taken with Canon EOS 450D camera and Canon EF 100mm USM macro lens, in natural conditions. I think that we all see dandelions as common weed which is not always easy to get rid of. On the other hand we all usually enjoy view on a meadow glowing with golden colour of thousands and thousands dandelions. 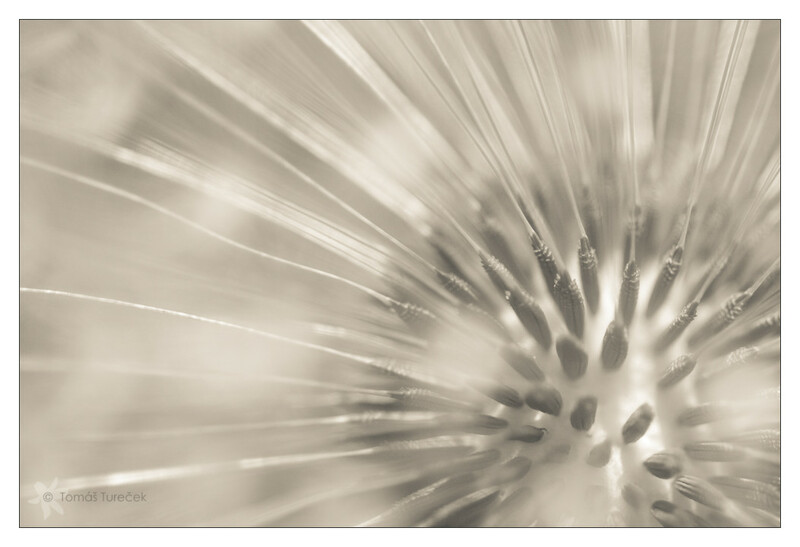 Last year I took some detailed photos of a dandelion which you can find in this post. 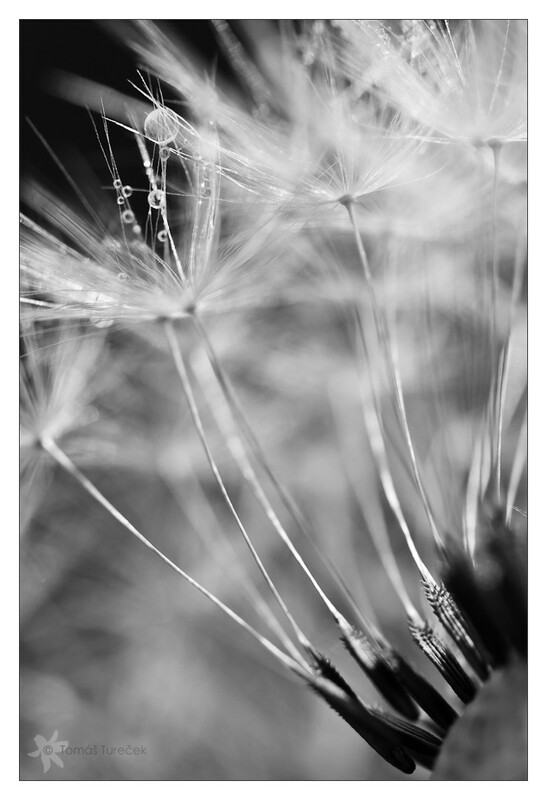 Also this year I have decided to take some dandelion photos but this time I wanted to try shooting seed heads. I used “Aged photo” preset in Lightroom 3.4 and did only couple of additional tweaks. 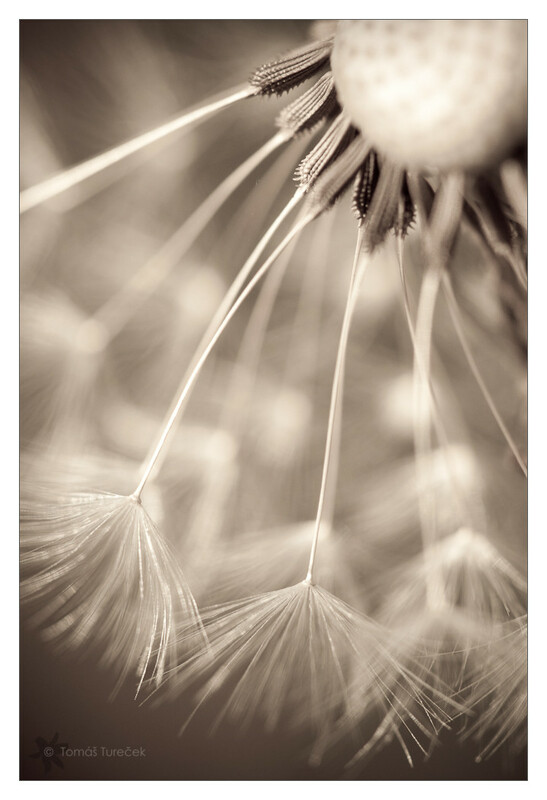 You can see a lot of dandelion photos nowadays on flickr and other photo related sites so I wanted to create something unseen and I think that I achieved it with this photo. At least I never saw anything similar. I used Lightroom’s “Creamtone”preset and did additional adjustments. I think it could look really nice on a big format. I saw uncountable amount of dandelion photos with water dropplets so I wanted to try to have some mine, of course. This was taken one foggy morning after the fog has dissappeared and after sun had some time to dry everything soaked due to fog. I visualized this with strong contrast and still soft. I hope that I made it. Whole processing was done in Lightroom without using any preset this time. I originally thought that I will use the same processing for all these photos making nice triptych but it did not work. Each photo asked for different processing and I think it’s much better this way. What do you think? Thanks for visiting and enjoy summer! Technical information: all photographies in this post were taken with Canon EOS 450D camera and Canon EF 100mm USM macro lens mounted to a tripod, in natural conditions, indoors.